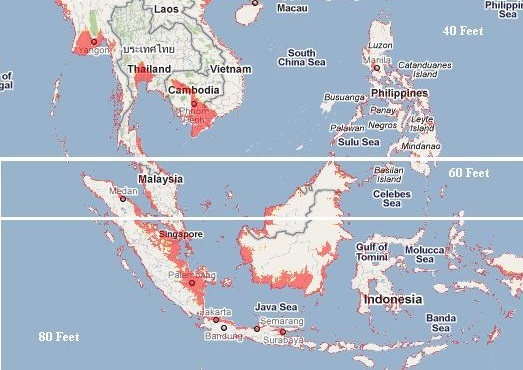 When the Zetas first laid out their 7 of 10 predictions in 2010, they stated that the Malay peninsula could anticipate a 60 foot drop in elevation. Sinking started in early 2011. 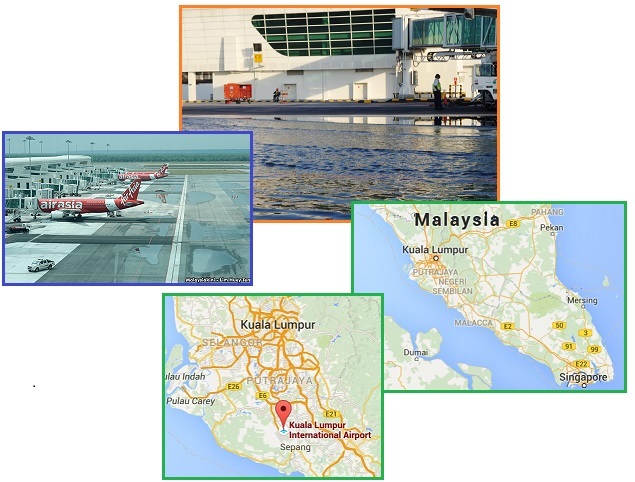 Kuala Lampur, where both the old and new Malaysian airports are located, is in that zone. They started construction on the new airport, klia2, in 2009. It seems the steady sinking has now caught up with the new airport! Kuala Lumpur International Airport’s new budget passenger terminal is sinking, with cracks appearing in the taxiway and water forming pools that planes must drive through. Construction of klia2 started in 2009 after the growth of low-cost travel, particularly by Malaysia-based AirAsia, pushed passenger traffic beyond the existing budget terminal’s capacity. AirAsia CEO Aireen Omar complained that the KLIA2 terminal was sinking, with cracks appearing at the taxiways and pools of water forming that planes had to drive through. 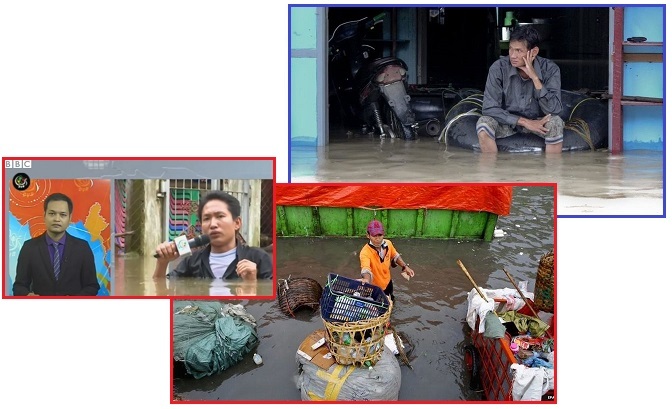 ZetaTalk Prediction 10/16/2010: If the loss of 40 feet in elevation is not devastating to the Philippines, it is to the coastline of southern Burma, Tailand, and Cambodia, which have vast areas that will suddenly and permanently be flooded. It is the southern tip of the tongue which is utterly devastated. Draw a line just north of the Malaysia border and over the top of Borneo. The land on the tongue from this point south will double its elevation loss, so that Java and the islands bordering the Banda Sea will find they have lost a full 80 feet in elevation, sinking many coastal cities and small islands out of sight. The Zetas predicted that Bangkok could anticipate a 40 food drop in elevation. When severe flooding occurred in 2011 it seemed to forebode that this time had arrived, but the anticipated drop in elevation had not yet completed. Yes, sinking had occurred. No, not to the 40 foot elevation, at least not more than the sea walls could hold back. But now matters are once again progressing. Nearby Myanmar is having the worst flooding in decades. Rain is blamed, as always, but it is failure to drain away that causes the floods. A new report from Thailand's government says that Bangkok, its capital city and home to some 14 million people, could be underwater in the next 15 years thanks to a combination of sinking land and rising global sea levels. The city, much of which lies at an elevation of just under 5 feet above sea level, already is sinking. A state of emergency has been declared in several regions of Myanmar after the worst flooding in decades. Nearby, in Bangladesh, which lies on the border of the Indo-Australian Plate, sinking is a steady nightmare. As India sinks, pushed under the Himalayas, Bangladesh suffers. Where rain is regularly blamed, the key is sea water pushing inland. This is not from rain. Sea walls are being constructed, yet the sea encroaches. 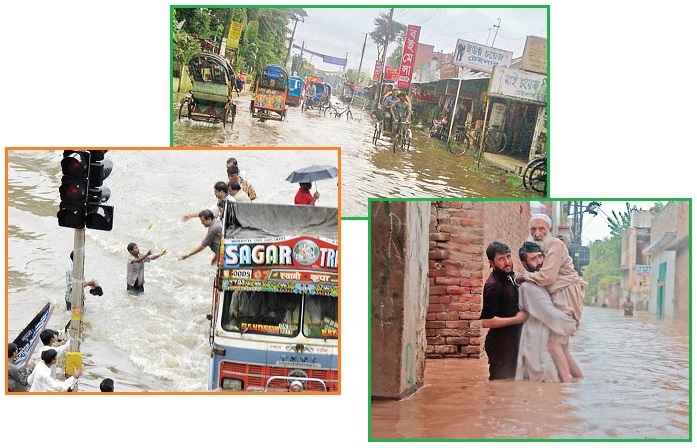 Flooding in Pakistan, on the other side of the Indo-Australian Plate, has been ongoing since 2011 also, as noted in the Pole Shift ning blog dedicated to this issue. Torrential rains, onrush of water from upstream and high tide have inundated vast areas in coastal districts, leaving tens of thousands of people marooned. Some residents also took shelter on roofs. Standing water caused traffic to suspend on Peshawar-Charsadda Road, disconnecting parts of the district. The 7 of 10 plate movement pace has picked up in the Caribbean also. In addition to quakes running up and down the Andes, the entire western edge of the Caribbean Plate along Central America has been covered in quakes. Jamaica had sea water running inland on July 8. Trinidad has registered a rip through its center along the plate border. Then on July 16, a 6.5 quake on the very eastern edge of the Caribbean Plate followed within days by the Kick’em Jenny submarine volcano creating a stir on July 24, forcing tsunami warnings. All this confirms the ZetaTalk prediction on what the S American roll would do to the Caribbean, though all this action is only now getting started in earnest. Was Magnitude 6.5 Quake Responsible for Waking up Underwater Volcano Kick 'em Jenny? 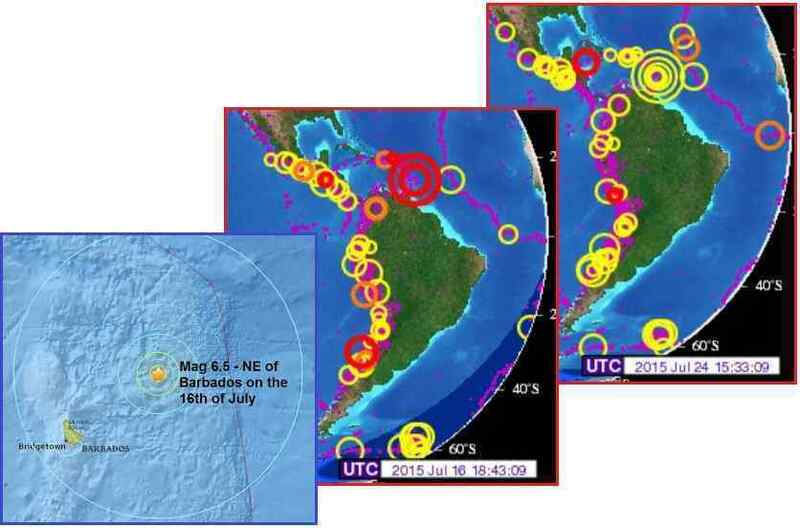 Signs of elevated seismicity (earthquakes) began on 11th July and continue to present. A submarine volcano near the coast of Grenada in the West Indies (Lesser Antilles) looks like it might be headed towards a new eruption. 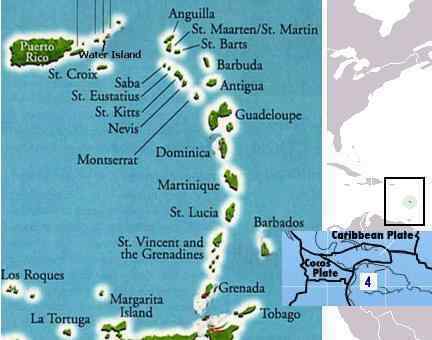 Kick 'em Jenny Volcano Tsunami Threat: Grenada, St. Vincent, Barbados and Trinidad Placed on Alert! Kick 'em Jenny Volcano Tsunami Threat: Grenada, St. Vincent, Barbados and Trinidad have been placed on alert! Evacuation routes and transport on standby. July 24, 2015. 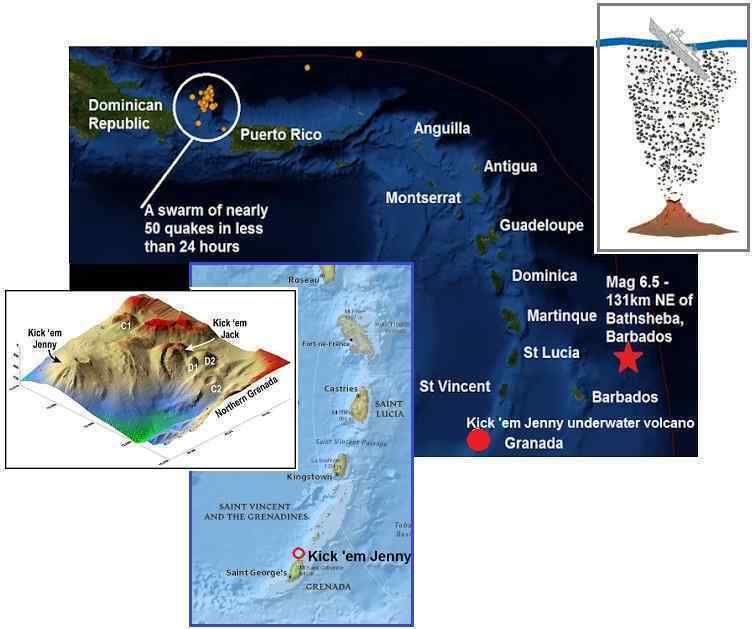 Kick 'em Jenny is an active submarine volcano or seamount on the Caribbean Sea floor, located 8 km (5 mi) north of the island of Grenada and about 8 km (5 mi) west of Ronde Island in the Grenadines at roughly 12.30° N, 61.64° W. Its summit is approximately 200 m (600 ft) below the surface of the ocean. ZetaTalk Prediction 2010: The Caribbean Plate will lift, slightly, on its northern edge, while plunging greatly on its southern edge, being pushed down by the overriding S American Plate as it rolls. Of course magma will be roiling, as the pressure from the southern part of the Caribbean Plate being shoved down into the magma will force this magma to go somewhere. It will move in the direction of least resistance, which will be toward the north, and thus it will rush under all volcanoes currently in the Caribbean or in Central America. Trouble in the Caribbean from the 7 of 10 plate movements predicted by the Zetas has only just begun. When done, some of the islands will be so inundated by sea water they will disappear. The Caribbean Plate is being pushed down by the hump of the S American Plate, so the Caribbean Plate tilts during this process. ZetaTalk Prediction 2010: Aruba, Bonaire, and Curacao ride on the hump, and thus will survive. The island chain along the eastern edge of the Caribbean Plate was formed when the Caribbean Plate was pushed up during expansion of the Atlantic. But this is countered by the hump of S America pushing the Caribbean Plate down, overall. Thus those islands in the chain close to S America will lose in elevation, while those islands at the top of the chain will not. From Antigua south, the islands in this chain can expect a minimum of an elevation drop of 57 feet, on average, with this being irregular throughout due to the trauma to the area. Islands just to the north of S America will be affected the most such that Barbados to Tobago may sink entirely except for the highest points, losing several hundred feet in elevation, and Trinidad will be torn apart in addition to sinking as it rides on the plate border. If the pace of the 7 of 10 plate movements has picked up again, how far along are we? The Zetas gave percentages on February 2, 2013, then again on March 7, 2015. But in the mere months since March the pace has marched along. ZetaTalk Report 3/7/2015: The sinking of the Sunda Plate is now perhaps 93% complete (up from 70% two years ago). The Pacific Plate has steadily compressed, with major quakes in Japan evident and the S American roll progressing to an estimated 27% at the current time (up from 13% two years ago). The African roll has barely started, now at an estimated 12% (up from 5% two years ago). At present, the New Madrid adjustment is perhaps at only 2%, but as the 7 of 10 movements will accelerate, this will now rapidly change. ZetaTalk Report 8/1/2015: The pace of the 7 of 10 plate movements has indeed picked up, most dramatically in the S American roll. The entire spectrum of the 7 of 10 plate movement, predicted by ourselves to begin at the end of 2010 with sinking in the Sunda Plate region, was slowed by the Council of Worlds. The Sunda Plate sinking we predicted did start on time, but is only about 95% completed. Tilting of the Philippine and Mariana Plates likewise is incomplete, at about 72% and 78% respectively. The S American roll has been sleepy, but over this past month has been notable with quakes along the Andes and in particular where the Caribbean Plate is pushing Central America westward and along the eastern edge of the Caribbean Plate. Prior Pole Shifts are often recorded, if not in direct records by surviving in legend and folklore. There is hardly a part of the world or a culture that does not have such tales. Certainly China is no exception. 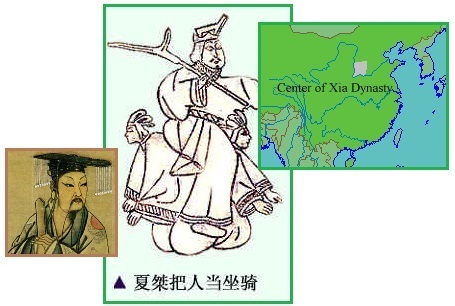 During the last Pole Shift c.1600 BC the reign of Emperor Jie of Xia suffered, and this was well recorded. Coming Earth changes - Messages from the Past! One of the oldest historical cultures on Earth are the Chinese. The ancient Chinese emperor Yahou, who is believed to have lived around the time of the last great cataclysm, (about 3600 to 4000 years ago), recorded the following account of strange cosmic events: “At that time the miracle is said to have happened that the Sun during a span of ten days did not set, the forests were ignited and a multitude of abominable vermin were brought forth. In the lifetime of Yahou the Sun did not set for ten days and the entire land was flooded (inundated). An immense wave that 'reached the sky' fell down on the land of China. The water was well up on the high mountains, and the foothills could not be seen at all." Written during the reign of Emperor Qin c.1600 B.C. But older legends from China are not so well dated. The legend of NuWa is highly allegorical, but clear in its description of the crustal shift that occurred – the sky moved to the northwest, and the globe slid to the southeast. The peoples of Miao that are mainly in China have a cult about the goddess NuWa! The Chinese legend tells how the world was swept by a Great Flood, and only Fu Xi and his sister NüWa survived. The earliest records speak of “S?n Huáng W? 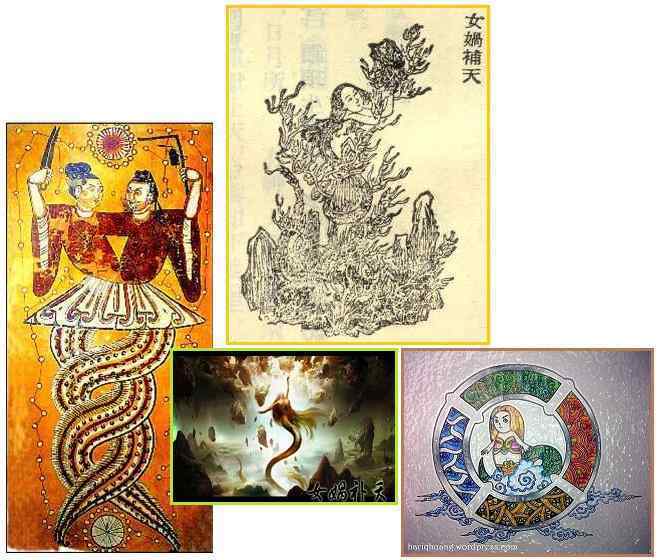 Dì”, meaning the “Three August Ones, or Three Sovereigns or Kings” The three Sovereigns are generally denoted as Fu Xi, NüWa, and Shen Nong Shi. There was a quarrel between two of the more powerful gods, and they decided to settle it with a fight. When the water god Gong Gong saw that he was losing, he smashed his head against Mount Buzhou, a pillar holding up the sky. The pillar collapsed and caused the sky to tilt towards the northwest and the earth to shift to the southeast. This caused great floods and suffering to the people. Nüwa cut off the legs of a giant tortoise and used them to supplant the fallen pillar, alleviating the situation and sealing the broken sky using stones of seven different colours, but she was unable to fully correct the tilted sky. Which of the many prior Pole Shifts might have caused this crustal shift? The Zetas have been asked to correlate past Pole Shifts with the Ice Ages and the locations of the poles. Per this detail, it was the Pole Shift that moved the N Pole from N America to Scandinavia 14,400 years ago that would have caused the crustal shift described in the NuWa legend. ZetaTalk Analysis 8/8/2015: Although the NuWa legend is not dated, the description of the tilt of the globe shows this to be the crustal shift from the N Pole position five steps back. From the current position in the Arctic  the N Pole was formerly over Greenland  then over the East Siberian Sea  then over the Barents Sea  off western Siberia then over Scandinavia  and then five back, over N America . The shift from N America to Scandinavia was significant, and it was this tilt of the globe that was recorded in the NuWa legend. For someone in China and southeast Asia used to seeing Polaris and related constellations overhead and slightly to the east, all this shifted at that time to being in the northwest. Thus as the legend says: “caused the sky to tilt towards the northwest”. This part of the globe also shifted from being closer to the N Pole to being a greater distance from the N Pole, thus further south, and at the same time shifting eastward. Thus as the legend says: “the earth to shift to the southeast”. Such a shift would push Asia and the China coastline into the water, thus the flood descriptions. What NuWa does is confirm the ZetaTalk we provided in 2002. Just another example of Zetas Right Again! Obama seems to be hinting at something here. Is Obama trying to get people ready for an Executive Order delaying the 2016 elections? Is this related to the pending announcement? Per the Zetas, these hints absolutely relate. Panic and riots might ensue, the Earth changes might rupture the New Madrid and create immigration nightmares along the entire southern border, including states that face the Caribbean. The host of The Daily Show, who will finish his 17-year run on the show next week, held talks behind closed doors with the President in 2011 and 2014 after being summoned by his aides. Obama made his seventh and final appearance on the show, and told Stewart: 'I can't believe you're leaving before me. 'In fact, I'm issuing a new executive order that Jon Stewart cannot leave the show.' The president continued to kid his host and added the order is 'being challenged in the courts'. President Obama told the African Union Tuesday that he felt he had been a “pretty good” president and if he were allowed to run for a third term, he’d probably be victorious. 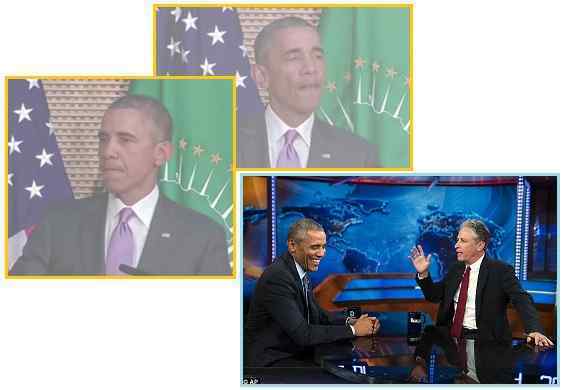 Obama made the remarks while criticizing leaders on the continent who wouldn’t step aside at the conclusion of their terms. This issue has made a splash in the press, including in Russia. Have there been any opinion polls on the matter? Yes! Would the US citizens prefer Hillary, with all her baggage, or Trump under whatever banner, or one of the cast of thousands of Republicans squabbling to climb onto the debate stage? Even without running, it appears Obama would fare well. And what would their opinion be if the nation were in the midst of a crisis? In what must certainly rank as a conspiracy theorist’s worst nightmare, the US military has just kicked off 'Jade Helm 15', a domestic military exercise that brings together over 1,000 members from the nation’s elite forces, including Green Berets, Special Ops from the Navy and Marines, and SEALS. A new Rasmussen Reports national telephone survey finds that just 30% of Likely U.S. Voters say they would vote for the president if he ran for a third term. Sixty-three percent (63%) would not. Most Democrats (57%) would vote to give Obama a third term.